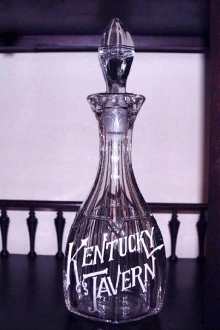 Fantastic Kentucky Tavern 1800's back bar bottle decanter. Great bottle with the original stopper. Irishman James Thompson joined George Garvin Brown (his second cousin) in the whiskey business during the mid 1870s. This uniquely shaped bottle with its ribs throughout the body of the bottle will display nicely with any collection.